Startup Weekend, the organization famous for its self-described 54-hour “entrepreneurship boot camp” has teamed up with the Kauffman Foundation on a new worldwide competition its calling the Global Startup Battle. It says that it hopes that 1,200 new companies and startups will be created in just one week from Kansas City to Croatia, and Milwaukee to Ethiopia. Timed to happen during Global Entrepreneuriship Week (GEW), the Global Startup Battle will focus on having companies battle against each other in their respective Startup Weekend events. The team that wins that weekend will face each other in a “best of the best” battle where they’ll post a 90-second video describing their company and product. The world will then vote and the top 15 will advance to the finals. A panel of experts will decide who will take the top honors — and it’s quite a panel: Zappos CEO Tony Hsieh, Foundry Group’s Brad Feld, TaskRabbit founder Leah Busque, prominent fund manager Chris Hollod, and actress/serial entrepreneur Jesse Draper. The winning team will receive a bevy of prices that will certainly help them grow their company. They will get a free VIP trip to Rio De Janeiro for the Global Entrepreneurship Congress, a trip to San Francisco to meet with Google, $5,000 each towards a PR launch package design services, and legal support, and finally $20,000 worth of Google Cloud services. 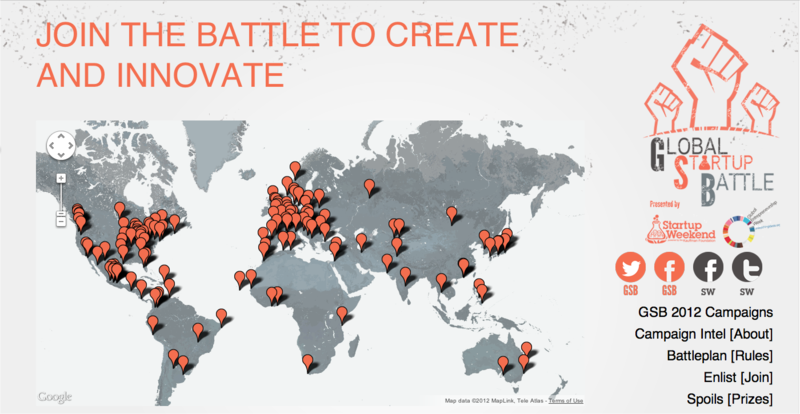 Global Startup Battle is in its second year and this year has doubled in size from 67 events to 130. It will occur over the two weekends during GEW from November 9-11 and 16-18. The winner will be announced the first week of December. In the last competition was won by AfterShip who launched an e-commerce platform for merchants and buyers that provided live notifications for shipments. Earlier this summer, it raised a seed round from Australia’s Business Switch with an undisclosed sum.